Frost or pipe beautiful icing basics, borders and more with ease using the indispensable Cake Boss Decorating Tools Plastic Cake Decorating Turntable with "I Love Frosting message. From the Cake Boss Decorating Tools line, this decorating turntable makes it easier and more enjoyable for bakers of all levels to decorate baked goods. 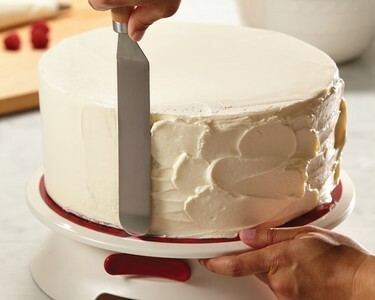 Hold your Cake Boss piping bag in one hand, gently rotate the turntable with the other, and in no time youll be decorating cakes just like the Boss! 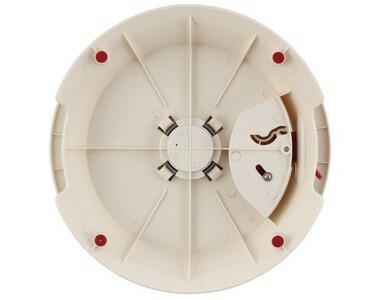 The rubberized ring around the turntable surface helps to hold layers in place as theyre frosted, and a non-skid base helps to keep the entire turntable from moving around. 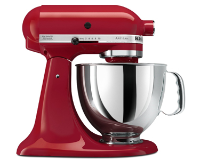 A convenient switch locks the turntable surface in place when necessary during the decorating of cakes, pies and even cupcakes. 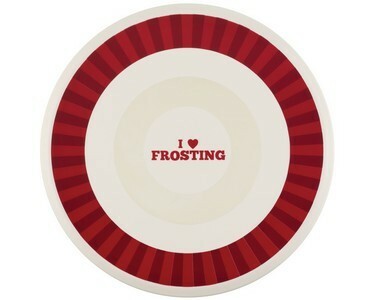 And because it has a fun "I Love Frosting" design right in the center of the turntable, it also works as a cake stand! Add this must-have decorating turntable, along with other Cake Boss Decorating Tools, to your collection of great items from all the Cake Boss lines. 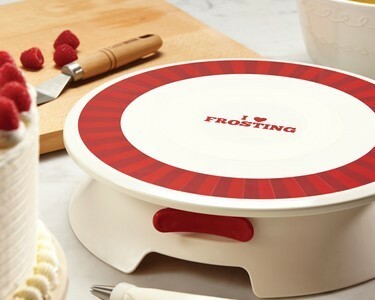 Take the Cake Boss Decorating Tools Plastic Decorating Turntable with "I Love Frosting" for a spin -- and create beautifully decorated desserts.